If you are planning a camping experience with your family this summer, then we invite you to experience our campground near Estes park, Colorado. Our cabins near Rocky Mountains National Park can accommodate many different groups and families. Our cabin rentals come with a variety of floor plans and styles and are great for families that want to experience the wonder and magnificence of the Rocky Mountains but still want the amenities of home. Our cabin rentals near Rocky Mountain National Park can accommodate groups ranging from 5 to 14 people! So get pack your bags and get ready to experience the best in Estes park cabin rentals near Rocky Mountain National Park that the whole family will enjoy. Rocky Mountain National Park includes some of the highest mountains in the United States. Our cabins and camping spots are close to all the beautiful landscapes that feature alpine lakes, forested valleys and a wide range of plants and animals. Rocky Mountain National Park in northern Colorado spans the Continental Divide and protects mountains, forests and alpine tundra. Our cabin rentals near Rocky Mountain National Park are so close to the grandeur of the park that you won’t run out of ideas for things to do while camping In Estes Park. We are known for the abundance of nature and history and of course great amenities and accommodations at our park! As you explore all of the great things to do at our park, we invite you to re-think camping! There are many ways to camp and we like to accommodate all styles. Whether you are looking for a no Hook Up Site or one that has electric and sewer, we got your site! We can also accommodate big rigs up to 40 feet, so come one come all and experience everything that camping near Rocky Mountain National Park has to offer. Just minutes away from our park, is Trail Ridge Road. It is a great trail that is approximately 11 miles and climbs to an elevation of 12,183 feet making this trail one of the most spectacular places in the world to stargaze. Of course as you experience camping at Rocky Mountain National Park, you will understand why it is one of the most visited national parks in the country. There are 600 buildings inside Rocky Mountain National Park, 150 of which are historic structures. Hundreds of species of animals inhabit the park, including moose, elk, deer, bighorn sheep, cougar, bear, fox, bobcat, porcupine, badger, and many others. The park also inhabits several species of fish, including 4 different species of trout that inhabit the park’s lakes and streams. There are also 355 miles of trails maintained for hiking within Rocky Mountain National Park and contains 450 miles of streams and 156 lakes. 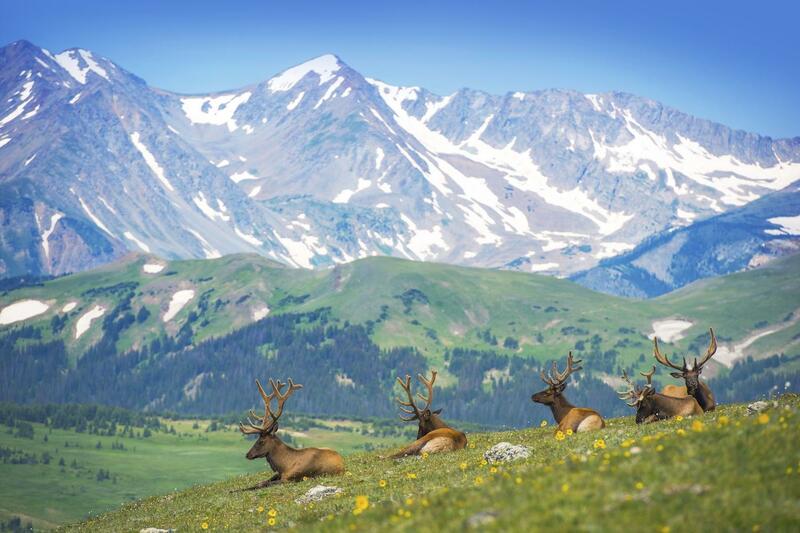 These amazing mountains cradle the Estes Valley, providing residents and guests with incredible beauty and fantastic camping near Rocky Mountain National Park. Be sure to make your reservation to camp in Jellystone Estes Park today. We look forward to seeing you and your family soon!